This page will explain how to use the advanced patient search feature in TRAKnet, which is found on the Properties tab of TRAKnet. The advanced patient search tool in TRAKnet is an advanced search that allows the user to search the list of available patients in their database by a stricter set of search criteria than the main patient search tool. The patient search can be accessed by clicking on the Properties tab along the left-hand side of TRAKnet and clicking Patients. In the properties tab you are also able to create Patient Groups by right-clicking on the word Patients to access the group menu. Click Add Group to create a new patient group. Once a group has been added, you may assign a patient to that group with the Group option on the patient's chart under Actions. Groups that already exist are listed as sub-categories of the Patient option in the Properties tab. Right-clicking on one of these groups allows the user to modify or delete a group. NOTE: Deleting a group will disassociate all patients from that group. If the group is then restored, the patient's will not be reassigned. There are a variety of search criteria that can be used to search for patients with the advanced search. These are described below. Add — Opens the Add New Patient editor window. Modify — Modifies the demographics of the selected patient. Remove — Deletes a patient. Chart — Opens the full chart of the selected patient. These filters have specific criteria applied to them: Begins With (Default), Contains, Ends With, Equals. Once patients have been generated using the above search, these patients can be filtered using several filters. The first of which is age. 0 = no filter, this is the default. Having 0's means that this will be excluded. For example, if you search for Min age 0, Max age 60, all patients aged 0-60 will appear. 120 = the maximum value for the age filter. As with age, once patients have been loaded with a patient search they can be filtered by gender, either Male, Female, or Any Gender (default). This filter will by the Marketing Referral field on the patient's demographics. All property values for Marketing Referral will be listed in this drop-down menu. New Marketing Referrals can be added under the Properties tab > Property Values > Marketing Referrals. This will filter the patient list by the patient's preference for how they prefer to be contacted. Phone — Patient must have either Phone (Home), Phone2 (Work) or Phone3 (Cell) along with the “Contact via Phone” checked per their patient demographics. Mail — Patient must have address, city, state and zip along with “Contact via Mail” checked per their patient demographics. eMail — Patient must have an eMail address and the “Contact via eMail” checked per their patient demographics. Birthdate — All patients with a birthday between the date range pertaining to month and day. If only start or end is used, it is specific to that month and day. Modified — Patients who were modified today. Seen — Patients who had an encounter with at least one diagnoses and one charge/treatment during the date range. Viewed — Patients who were viewed on a given day. Note: For any of these to apply, either start or end date must be used. This filter depends on the date filter and will show all users or providers, depending. For example, Date Seen will show Providers. Date Viewed might show both. Date Created, likewise, might show both providers and users, as any can create a patient. Note that this does not apply to a birthdate filter. Limits the number of patients returned. This is defaulted to 100, and 0 means there is no limit. If no limit is selected, a warning will pop up alerting the user that all results will be returned and it will take extra time. Please note that the higher this number, the longer this list will take to load. These check boxes show patients who would otherwise be hidden, such as patients who are inactive, who are in collections, or who are deleted. 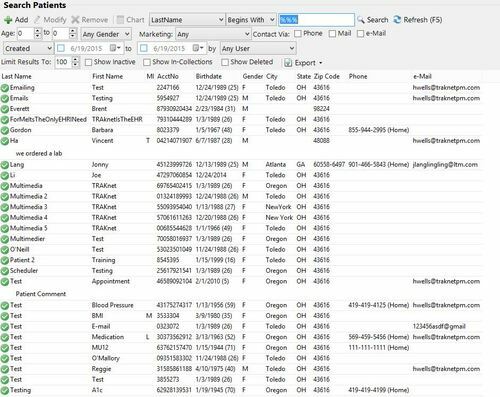 Other than a more in-depth patient search, the biggest feature of the Advanced Patient Search is the ability to export the list of patients you generate. After using the above described filters to show the patients you would like to see, you can click on the Export drop-down menu to select what fields should be exported for each patient and export a .csv file. Select fields will allow the user to choose which demographics are exported, for example first name, last name, and email address. Changes made to filters will save until TRAKnet is restarted, at which point they will default once more (the items checked in the above image are the defaults). When selecting To .CSV file, you will be prompted to save the file in any file path. This can be opened with Excel or a similar software.